Cheim & Read is pleased to announce Joan Mitchell: Drawing into Painting, a survey of works on canvas and paper from 1958 through 1992, the year of the artist’s death. The exhibition, which will open on October 27, 2016, and run through December 23, will be accompanied by a catalogue featuring an essay by Mark Rosenthal. Cheim & Read will host a panel discussion on Joan Mitchell with Mark Rosenthal, Joyce Pensato, and Louise Fishman, moderated by Phong Bui, on Thursday, November 3, from 6-8 PM. For Mitchell, drawing and painting were related but autonomous activities. Her pastels can be as dense as oil paintings, and her oil paintings can be as light and airy as watercolors. The exhibition includes art from each decade of her career, with a formal range spanning flurried strokes and gestural lines of rhapsodic color, to darkly massed forms and complex, multi-panel formats. Featured among the large works in oil on canvas are the ravishing diptych “Heel, Sit, Stay” (1977) and the turbulent “La Grande Vallée XVI Pour Iva” (1983), painted in high contrasts of indigo, violet, lemon and lime. The sweep and complexity of Mitchell’s painterly language is built on an armature of drawing, whether it’s a feverish tangle of colored pencil lines or a series of loosely demarcated partitions dancing across a seven-panel pastel. Whatever its approach, each work in the exhibition embodies a unique consideration of color, gesture and structure, and a deeply felt understanding of the expressive potential of the graphic mark. 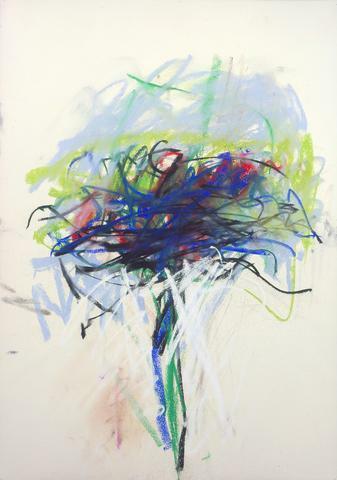 Joan Mitchell was born in 1925 in Chicago, and spent half her life in France, where she died in 1992. In 1951, her work was exhibited alongside that of Jackson Pollock, Willem de Kooning and Hans Hoffman in the celebrated “Ninth Street Show,” which marked the ascendancy of Abstract Expressionism within the development of modern art. Mitchell has since been the subject of numerous museum exhibitions, and examples of her work hang in nearly every major public collection of modern art, including the Art Institute of Chicago; Centre Georges Pompidou, Paris; the Guggenheim Museum; the Museum of Contemporary Art, Sydney, Australia; the Museum of Modern Art, New York; the Osaka City Art Museum of Modern Art, Japan; the Samsung Museum, Seoul; the Tate Gallery, London and the Whitney Museum of American Art, New York. Mitchell’s work is also featured in several current and upcoming historical surveys: Woman of Abstract Expressionism at the Denver Art Museum through Sep 25, 2016; Abstract Expressionism, a touring exhibition at the Royal Academy of Arts, London, September 24, 2016 – January 2, 2017, and the Guggenheim Museum Bilbao, February 3 – June 4, 2017; and Approaching American Abstraction at the San Francisco Museum of Modern Art, May 14, 2016-ongoing.